Mansfield Employee Runs First Marathon; Qualifies for Boston Marathon! PERRYSVILLE, OHIO – On September 26, 2015, Mansfield Plumbing employee Dave Fletcher ran 26.2 miles in the Akron Marathon. He started training just 51 weeks before the event and ran his first marathon in a time that qualifies him to run in the Boston Marathon in 2017. 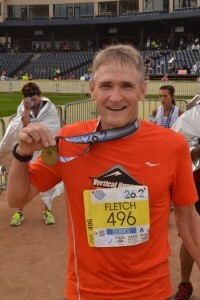 Fletcher, 63, finished the Akron Marathon in four hours, four minutes and 36 seconds. He began training when he got out of wind while bike riding with his grandchildren. He decided to run to get in shape. When he started getting good at it, he went to a local store to buy running shoes. That’s when he joined a running club and got serious about the marathon. Fletcher, the father of three sons, has worked at Mansfield Plumbing in Perrysville, Ohio for 30 years; the last 25 as a modeler in the Model Shop. “I was a bit nervous about the race, so I just threw myself into my work at Mansfield,” says Fletcher. “It requires a lot of thinking and we’re always busy. It’s both a rewarding and enjoyable career. Just prior to the September race Fletcher ran 22+ miles, then he tapered down to prepare for the marathon. Leg cramps at night were solved by drinking pickle juice. Bike rides with his four grandchildren became easier. And, pasta every night for a week built up his reservoir of strength.